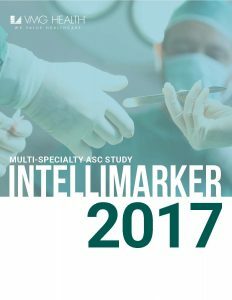 The Multi-Specialty ASC Intellimarker (the “Intellimarker”) provides detailed financial benchmarking information and analysis on ambulatory surgery centers (“ASCs”) across the United States. The study is based on detailed information provided for 278 centers around the country representing an aggregate surgical case volume of over 1.3 million. Data included in the study is from 2015 and 2016. The information provided has been divided into sections which cover all significant areas of financial and operational performance. These benchmarking sections are as follows: income statement, balance sheet, liquidity, case mix, case volume, payor mix, net revenue per case by specialty, EBITDA margin, staffing, operating expenses, and facility information. The study also includes a regional analysis which allows users to compare benchmarks across various regions. Download the 2017 version of the Intellimarker by filling out the form below. VMG Health’s Intellimarker is now on the web. Learn more about intellimarker.com and how to register for the free content. Complete the form below to request the latest Intellimarker as a PDF document via email.